A UC Merced study authored by former doctoral student Kaitlin Lubetkin, Professor Leroy Westerling and Sierra Nevada Research Institute (SNRI) scientist Lara Kueppers found that these meadows are being increasingly overrun by forest as changing conditions allow the offspring of nearby trees to take hold in meadow environments that previously favored shrubs and grasses over saplings. For the many species that depend on meadows, this change may force them to find new habitats. “Your average meadow will be essentially gone by the end of the century,” Lubetkin predicts, based on her field research and projections of climate warming. Tree encroachment into meadows isn’t new, but Lubetkin’s data — published online in the journal Ecological Applications — indicates that the process has accelerated. To find out, Lubetkin surveyed 30 meadows over five summers, measuring the age and size of encroaching trees, as well as the number of trees in each meadow. 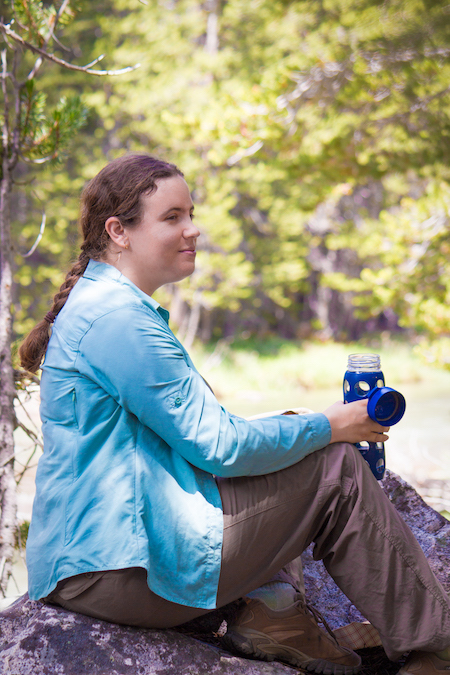 She opted for meadows that have been relatively untouched by humans, to reduce the impact of direct human activity on the meadows in her study. Lubetkin also chose to focus on ecologically important meadows that scientists have largely ignored. In their study, the authors demonstrate that encroachment is closely associated with the presence of lodgepole pine trees in the meadows’ vicinity. But, as with many recent changes affecting the Sierra Nevada, the main driver of meadow-to-forest conversion is climate change. As the climate changes in ways favorable to lodgepole pine, meadows will continue to disappear. And loss of biodiversity isn’t the authors’ only concern. 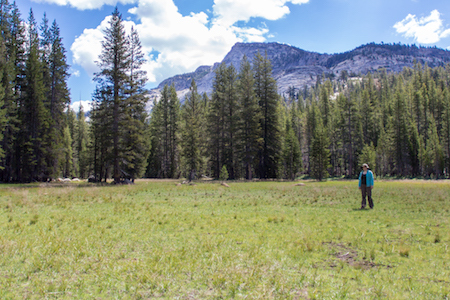 Though meadows occupy only a small fraction of the total Sierra Nevada landscape, their collective impact far exceeds their size. More than just hotspots of biodiversity, they play a huge part in regulating Sierra Nevada water systems. Given the delicate balance of California’s water system, which relies heavily on snowmelt from the Sierra, the authors worry that meadow loss may lead to a dramatic change in how water is stored and used. With deeper roots, trees tap into parts of the water table that meadow species can’t access. And replacing seasonal meadows with evergreen forest will result in year-round rather than seasonal water use, potentially draining the natural reservoirs that accumulate beneath meadows. However, the extent of the impact remains to be seen. This project was funded by a Mildred E. Mathias Graduate Student Research Grant, by grants and fellowships from UC Merced and by the NOAA Regional Integrated Sciences & Assessments Program.